A TimeZone is a Java class for a region of the earth that keeps the same time. Spelling is chaotic. The Java class is spelled precisely TimeZone. When you see that spelling on this website, you know I am referring to the Java class. Authorities say that time zone, timezone and time-zone are all correct. You will more frequently see timezone in the USA and time-zone in Britain, however, I have discovered from study Google hits, that most people including the Americans and Brits use time zone. I attempt to use the time zone spelling consistently on this web site. In ordinary use, a time zone is a region of the earth that keeps the same winter time. They may or may not all flip to summer time at the same time and some parts may not flip at all. The names for time zones used in Java comes from a database maintained by Arthur David Olson. For reasons only he understands, Pacific Standard Time is called America/Los_Angeles. The earth rotates counter-clockwise when viewed looking down on the north pole. The earth rotates west to east. In natural time, noon is when the sun is highest in the sky. This happens at one instant each day and at a different instant each day for each degree of latitude. People back east get up earlier and go to bed earlier. The reason we have time zones is to make synchronising railway (and later airline and TV) schedules easier. If we used natural time, based on observing the instant the sun were highest in the sky, every town would have its own slightly different clock from its immediate neighbours. This is how things used to be done in the days of the stagecoach. Timezone names never contain spaces. They use underscores, e. g. America/Los_Angeles. In Linux, make sure /etc/sysconfig/clock use official underscore names. Use UTC rather that GMT (Greenwich Mean Time) for the base time used internally. GMT is London civil time and has a DST (Daylight Saving Time) correction in summer. UTC huh not CUT? It was a weird compromise acronym half way between French and English. GMT stands for GMT. See GNU Timezone classes that correct for historical changes and leap seconds. You can find out the current time at any place on the globe at WorldTimeServer.com. It will tell you the offset from UTC, but not the time zone name. huh not CUT? It was a weird compromise acronym half way between French and English. Unfortunately, you can’t extract the rules about when daylight savings go into effect from a TimeZone object. I suppose if you were patient you could deduce them by binary search on inDaylightTime. You could also study the code that is used to construct all the TimeZone objects in rt.jar, or the various locale jars and decompile and parse that to extract the information. Here are the rules for the switch days in the EU. There are some algorithms to compute them. Switch days are decided politically so can change erratically, especially in the USA, albeit with advance notice. In ancient Rome, one could bribe officials to have months lengthened or shortened, so we have made progress. An ordinary citizen, David Olson has maintained a database of timezone and DST trivia that was used by the entire computing community. It was a much bigger job than you might imagine. Have a look at some of the changes in 2011. He has retired his server because a mean-spirited astrology company, Astrolabe, sued him distributing data free they sell. This information is clearly in the public domain. It is no secret when DST stops and starts and how far off UTC each spot on earth was at various times in the past. He did not have the resources to fight back. So for now, there is no one keeping track! Perhaps Anonymous could punish Astrolabe for this evil deed. 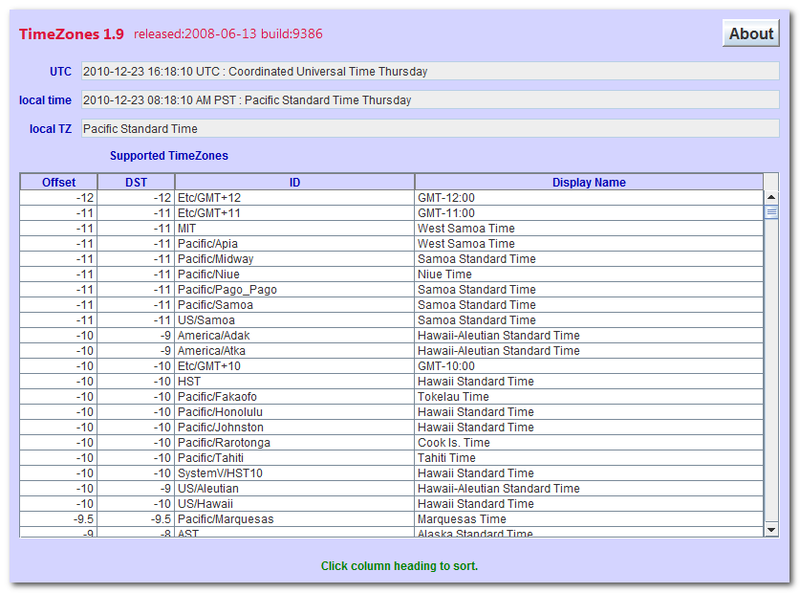 Perhaps Oracle could sue them for selling their timezone data. These turkeys attempted to screw Microsoft, Oracle, AT&T (American Telephone & Telegraph), the airlines, the railroads and every operating system/computer program that deals with local time. They all rely directly or indirectly on the Olson tables. All went well and Astrolabe was handily defeated.